Yes, the rumors are true – the legendary Paul Simon is touring for the last time ever. 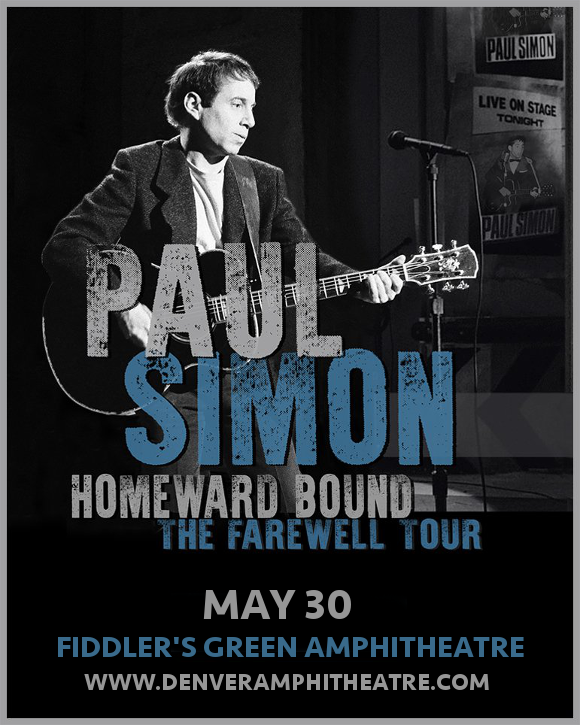 His Homeward Bound Tour is coming to the Fiddlers Green Amphitheatre on Wednesday 30th May 2018! No fan can afford to miss their final chance to see one of the most important songwriters of all time live – so get those tickets quick, before someone else does! Best known, of course, as half of the iconic duo of the 60s, Simon And Garfunkel, Paul Simon was responsible for writing nearly all of their songs, including their hit singles. When the pair split up in 1970, he went solo, writing 3 universally acclaimed albums over the course of the next five years, his most famous of which is the African-inspired “Graceland,” widely considered one of the most influential albums written of its decade. The recipient of 16 Grammy Awards, Paul Simon has left a legacy behind him that thoroughly deserves to be celebrated. What are you waiting for?? Get your tickets NOW while you can!